I spent a lot of time with only a few games this month. I beat some small titles, Mario vs Dk, Tengami and Indiana Jones and the Fate of Atlantis, but most of my time was spent plugging away at Monster Hunter 4 Ultimate and Mass Effect, with some leftover time spent with Tales of Graces f. In all, it was a good month, though I didn’t end up liking those latter two as much as I had hoped to. Monster Hunter 4 Ultimate – wrote about it here. Yeah, I am still playing this. I haven’t put anything else in my 3DS for more than a month. I am really close to finishing up the single player quest and I am about halfway through the multiplayer High Rank ones. I’ll get sidetracked by Etrian Mystery Dungeon, but I’m going to keep plugging away at this. It is so great. Tales of Graces f – wrote about it here. I am still picking away at this. I’m not sure I am going to finish it, but I haven’t yet given up on it. Yakuza 4 – I made some progress in this. I want to savor it, but I think I am taking it a little too slow. I should have it finished before too much longer, and hopefully I can find something to say about it, other than saying it is great. Persona 2: Eternal Punishment – Still keeping up my glacial pace through this game. I like it, but it just keeps getting put aside for things that are a little more immediate. This is a pretty great little game from Nintendo. It uses the pretty standard MvDK formula here, which once you get past the disappointment that the series is not going to be a continuation of DK94 is pretty swell, but with an added focus on creating and sharing stages. 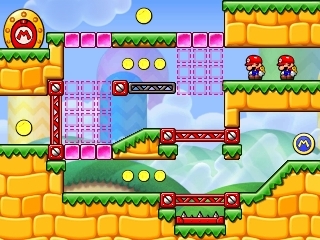 I think some of it is a dry run for Mario Maker later in the year, with Nintendo testing the waters of created contend. I want to really get into creating stages with this, but I’m not very good at it. I will make some time for the foreseeable future to keeping toying around with this. Also, it is Nintendo testing the waters with cross buy, though I have yet to claim my 3DS copy because that would mean turning off Monster Hunter. Indiana Jones and the Fate of Atlantis – I don’t think I’ll ever really like point and click adventure games, but I get just enough enjoyment out of them that I keep going back to the well. This game certainly deserves its reputation as one of the greats of the genre; it does a better job of getting what makes Indy work than any other game I’ve played with him in it. It really is a fine example of the genre; I just don’t seem able to fully enjoy them. Mass Effect – wrote about it here. I never really grew to like playing this game, though I did like tooling around in the MAKO and goofing off. Also, the story is actually pretty good. The flow of the fights was just off throughout, though. Tengami – This is another kind of point and click adventure, for the most part. It has a nice pop-up book art style and some generally pretty good puzzles. I liked it, but I don’t have much to say about it. It is good. Mass Effect 2 – This or Dragon Age Origins or Knights of the Old Republic. I wasn’t really intending to play through the whole Bioware catalogue this year, but I’ve sort of stumbled into doing it so I am going to keep doing it. Etrian Mystery Dungeon – I was on the fence about this, because I am not a particularly big fan of Mystery Dungeon games, but the more I saw of it, the more it looks like it took the things I don’t like about roguelikes and replaced them with stuff from the Etrian Odyssey style dungeon crawlers. Pillars of Eternity – My computer can’t quite run this, but I might be able to borrow one to try to give it a go. I was really looking forward to this, so I can work something out. It is sure to be another time sink that I am more than happy to sink my time into.